Former Krokus singer Henry Fries and guitar virtuoso Pierre-Alain Kessi are The Rockdaddies. They're putting together a double CD with songs from the 60s, for the use in school workshops. This project ended successfully on 18/12/2012 10:00! You get an autographe of «The ROCKDADDIES». Previous rewards plus a ROCKDADDIES Baseball-Cap. Previous rewards plus a signed double CD. You get an autographe of «The ROCKDADDIES» and a signed double CD. In addition you will be mentioned as a sponsor in the Booklet and get an invitation to the voting of the song selection, which will appear on the CD. You get an autographe of «The ROCKDADDIES», a signed ROCKDADDIES Baseball-Cap and a signed double CD. In addition you will be mentioned as a sponsor in the Booklet and get 2 tickets to the CD release concert. Previous rewards plus you will visit us during our work on the mix of the CD. You get an autographe of «The ROCKDADDIES», a signed ROCKDADDIES Baseball-Cap and a signed double CD. In addition you will be mentioned as a sponsor in the Booklet and get 2 tickets to the CD release concert. In addition you will visit us during our works in the Sterlingsound Recording Studios on the mastering of the CD in New York. The journey and the accommodation is included. You get a signed double CD, you will be mentioned as a sponsor in the Booklet and get 2 tickets to the CD release concert. In addition the ROCKDADDIES will play 1 Set of 45 minutes on an event of your choice. You get a signed double CD, you will be mentioned as a sponsor in the Booklet and get 2 tickets to the CD release concert. 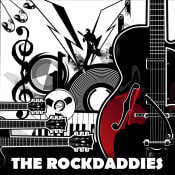 In addition the ROCKDADDIES will play 2 Sets of 45 minutes on an event of your choice. Der frühere Krokussänger Henry Fries, mit dem Krokus ihr erstes wegweisendes Album «Metal-Rendez-vous» zusammengestellt haben, hat mit dem Gitarrenvirtuosen Pierre-Alain Kessi ein tolles Schulprogramm zusammengestellt. Ein Blick zurück in die Anfänge der Rockmusik mit zwei Urgesteinen der Schweizer Musikszene.